Every trail ride is a gift. I cherish the time that I spend with a horse. I always have. I wanted a horse as a child more than anything. I drew horses all of the time and asked for a horse every birthday and Christmas. I waited 31 years to finally have my own horse, Snickers. I rode that horse for 18 years and was thankful for every minute that I spent with him. 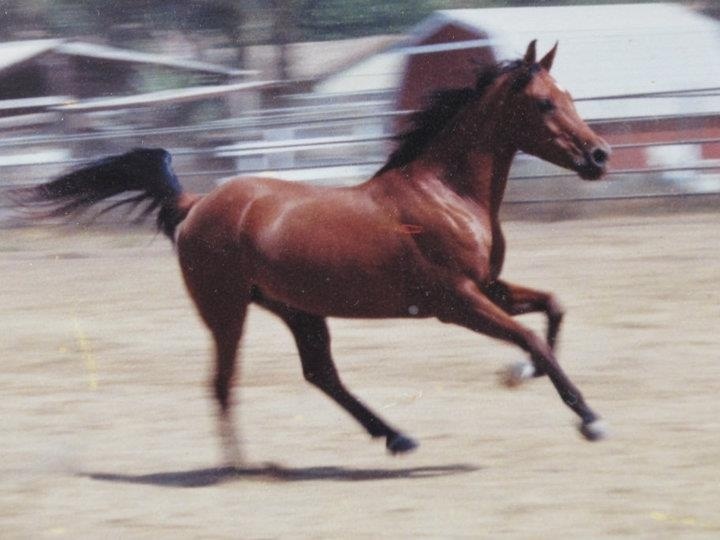 I have such fond memories on trail with Snickers at Shaffer's Ranch. It was just he and I alone on trail with the wildlife, the sounds of nature and the bond of friendship. It's the friendship between a girl and her horse that only an equestrienne or a cowgirl can understand. Being out on that trail for me was the most natural and free place for me. It was my home, my happy place. When I lost him 5 years ago, It left a huge hole in my heart. Today, the ranch is gone and Snickers is gone. There's no going back. So, I buried myself in work. Focused on being a mom and a good provider. I have worked literally 60 to 80 hours a week to build this business, re-inventing it as things change in order to make a good life for us. But, I'm tired. My hand hurts. I love selling jewelry, but I want to go outside. This year is the Chinese year of the horse. At the turn of the new year, I posted on Facebook that it was indeed the year of the horse and perhaps this would be the year that I would replace Snickers. At the time, I did not know it, but through a wonderful and amazing chain of events that only angels could orchestrate, I now have my dream horse, Red. He's so much like Snickers that it blows my mind. I never could have found him on my own. Never. So this morning, there was a storm coming in and no one wanted to ride on trail. I have only had Red 6 weeks. He's a retired show horse that his owner out-grew and lost interest in. 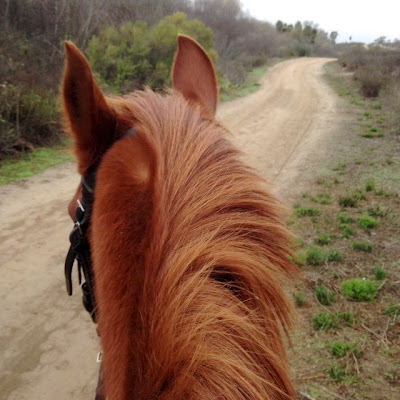 We have been going out several times per week as he learns to be a trail horse, but have only been out with others. I got to the ranch at 7:30 AM and Red & I decided to go for it. We decided to go out on trail alone and try to get back before the storm. It was such a beautiful morning. As we rounded the corner at the trail head, I had that nervous feeling in my stomach wondering if he would go, wondering if he would be spooky or start acting hot because of the cool weather. But, he went. We went. It was so beautiful. The sound of the water in the creek, the wind in the trees and Red's hoofbeats were all muffled by the cloud cover. The eucalyptus trees were alive with fragrance as we passed the roadrunner pair who were hunting for a tasty something in the long grass. I savored every moment. This was the world from my view this morning. Peaceful. Just after I shot this photo, the rain started to fall, and so did the tears. They were tears of joy and gratitude for this amazing gift I have in Red. I needed him and this. He needed me too. For two years he stood in his stall waiting for his owner to come ride him. Now, he has someone to spend time with every day. Someone to love on him and tell him he's special. 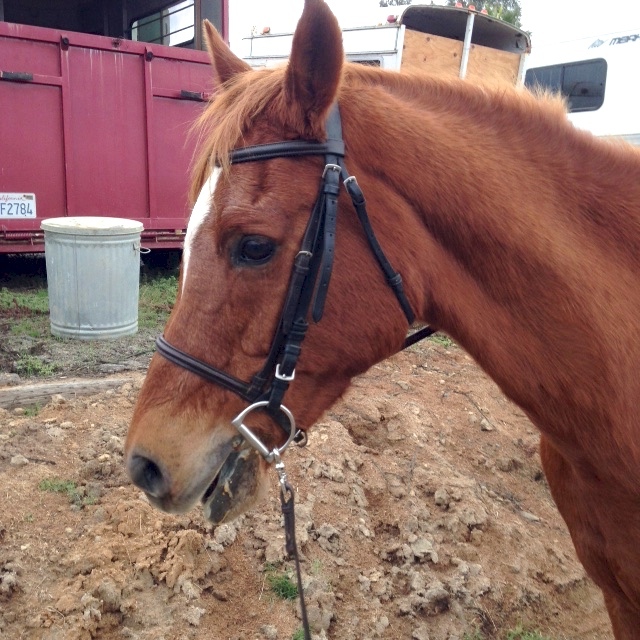 Here's a photo of as very proud red Arabian horse who did something a bit scary today and succeeded! We succeeded! This is going to be a great friendship. Such a gift. Thank you angels. Thank you God.